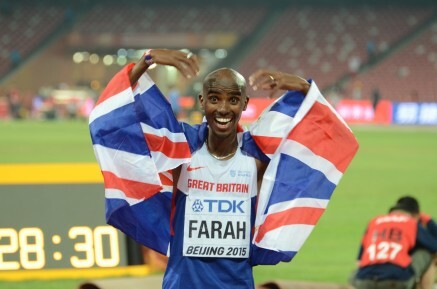 29th August 2015 – Mo Farah (GBR) completed an unprecedented triple-double by winning the 5000m at the IAAF World Athletics Championships. This added to the 10,000m title he won a week ago and now means that Mo has won the distance double at the last three global championships (2012 Olympics, 2013 World Championships, 2015 World Championships). He also become the only man to win the 5000m World title on three occasions by virtue of his gold in Daegu 2011 as well. In a slow, cagey, tactical affair it appeared no-one wanted to make the first move with Mo even having to time to take a detour to lane 7 to collect some water on one of the early laps. The race finally got going with 5 laps remaining as Mo moved to the front and slowly began to up the tempo. This increased again as Kenyan rival Caleb Ndiku passed Mo with 800m left to run. Using all his experience Mo did not panic and just tucked in on Ndiku’s slipstream. They ran stride for stride for the next 700m until Mo once again showed his superior finishing speed to move clear up the straight and cross the line in 13:50.38. This is included an incredible last 800m split of 1:48.6 and a sub 4 minute last mile. Galen Rupp (USA) acquitted himself well again to finish fifth in 13:53.90. Usain Bolt (JAM) added to his ever growing collection of World Championship gold medals by anchoring his Jamaican quartet to victory in the mens 4x100m relay. The winning time of 37.36 seconds was the fastest time in the world this year. On the day she officially announced she was joining PACE Sports Management Jenna Prandini (USA) celebrated in style by gaining her first World Championship medal. Running the third leg for the USA 4x100m team Jenna contributed t the team crossing the line 41.68 seconds. Dina Asher-Smith ran a storming second leg for the British quartet that wound up fourth in a new British Record of 42.10 seconds.